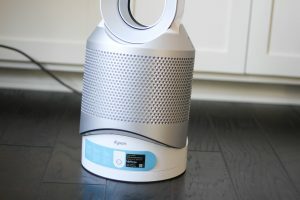 I received the mentioned item in this post from Dyson to share in an honest review. As always all thoughts and opinions are 100% my own. Everyone knows about Dyson and the amazing vacuums they have that keep your floors and home clean. We have one and yes we love it. So naturally we wanted to explore more products Dyson had to offer. 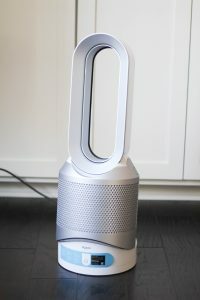 Get excited because I’m going to tell you how we are keeping our air clean with the Dyson Pure Hot+Cool Link™. This little machine does a lot! But Eryka, what does a Dyson Pure Hot+Cool Link™ do and why do I need one? Those are great questions and I’m going to answer it all! And if you are a visual learner like me, I have pictures for you.. you’re welcome! Beyond the air filter, it also has a heating and cooling feature. So if you are feeling a little chilly, like I have been this winter, you can bring it into a room and heat up. What are the other cool qualities of the Dyson Pure Hot+Cool Link™ ? This is a bladeless fan! As a parent to a child with tiny fingers, this is huge. Not only that but when the heater is on it never gets hot enough that when you touch it, it could burn your child. A big mom win, in my book! Lost the remote or want to do even more with your Dyson? No problem, you can download the app. 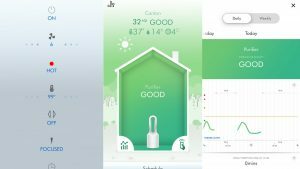 Not only does it work like a remote it also tracks the air quality , tells you the humidity and temperature of the room. If you don’t want to have to worry about the air quality it can track that for you by turning on the auto mode. This mode allows the Dyson Pure Hot+Cool Link™ to track the air quality automatically and turn on as needed. Another cool feature, you can put it on a schedule where it will turn on and off automatically during the week. I’m technically challenged at times and I’m just to busy to fool with things that are hard to figure out. No worries, Dyson creates products that are easy to use. 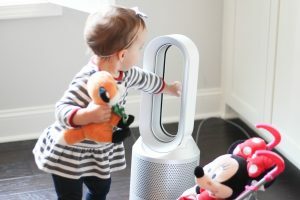 The simple on and off button is on the bottom and you can tilt the body of the Dyson Pure Hot+Cool Link™ to get the cool or warm air angled where you like. 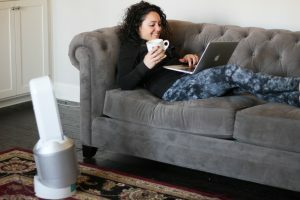 If you are looking for a fan, heater and air purifier then this 3 in 1 machine is seriously perfect! I’m going to go cuddle with the heat mode now, stay warm guys! I seriously need this. We have to use a heater in Gabriels room and it worries me all the time. This would be so much safer! Yes and you could have it set to turn on certain times in the night and turn off certain times in the morning ?? I cannot show this to my husband or he will want it. Our old house is so drafty! We love our Dyson! I sleep with it on every night! I love it! I think we might need one! Great design! Thanks for the informative intro to the product! You always show off the coolest products I’ve never heard of! My husband and I were just saying we needed a space heater for my daughter’s room…this seems like a much better idea! It’s so much more safe! I love it! Love the app! How cool! And yes, definitely a mom win that it doesn’t have blades or get too hot!!! I definitely need this! My husband and I like it completely different temps so this would be amazing! This would be great in my girl’s room! Love Dyson!